Burlington's innovative furniture ranges are sure to add style and sophistication to any traditional setting with its elegant designs. 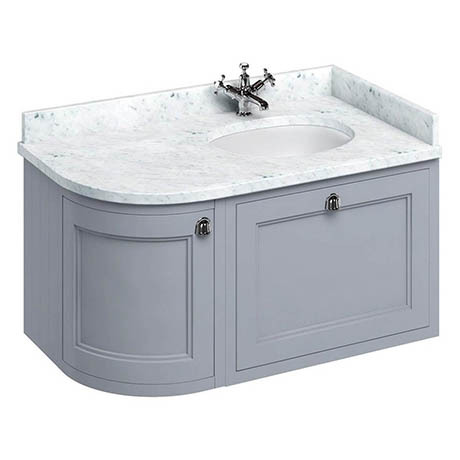 Creating the illusion of space, this wall hung curved vanity unit is designed to fit into a corner which makes it ideal for bathrooms with limited space. Each unit is coated with 5 layers of ultra-violet stabilised primer to prevent colour fading, it is then painted with a top coat from a range of stunning finishes. The chrome plated brass handles add a vintage feel to this beautiful cabinet. The unit comes with a choice of 3 stunning Minerva worktops - Carrara White, White or Black Granite. Each worktop has an integrated basin with built in overflow and comes supplied with an optional backsplash. Please note: worktops come supplied with no tap holes and are to be drilled by the installer. A template is provided indicating tap hole positions and sizes.